I’ve made plenty of marshmallow brownies, but they’ve always involved scattering the marshmallows on top a few minutes before removing the brownies from the oven — a step prevents them from melting into the brownies and disappearing. But these melted marshmallow brownies are a little different. Here, you stir in the marshmallows into the brownie batter before it goes into the oven. The idea is that the marshmallows melt into the brownies leaving behind little air pockets and a chewy top. It’s another way to make a crusty brownie. 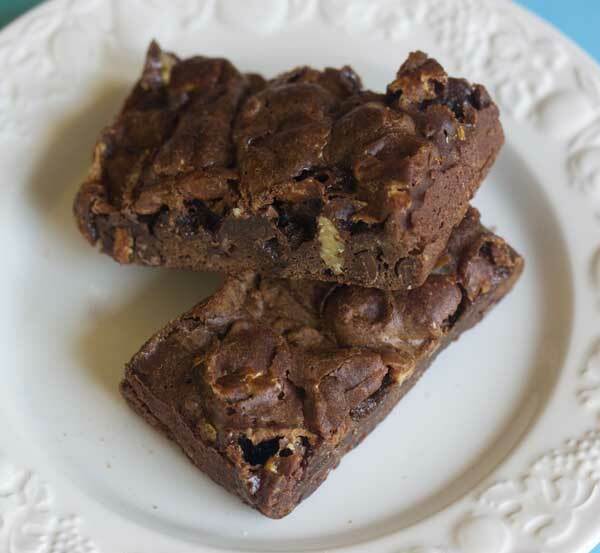 I learned about this kind of brownie while reading a baking board. Someone on the board noted that a certain bakery in Chicago used the melted marshmallow technique to make their brownies chewy. After finding a few different recipes that involved adding marshmallows early on in the batter, I settled on this one, which had only 1 review, but sounded good and not too sweet like some of the others I’d seen. I modified it slightly by making a half version and baking the brownies in an 8 inch square metal pan. As I put the brownies in the oven, I was pretty skeptical as to whether all those marshmallows would disappear, but after 28 minutes in the oven they (pretty much) did. Now it was obvious that marshmallows used to be there, given the lumpy, bumpy, scraggly topped cake, but they certainly did melt and the brownies had a wonderful chewy top. After sampling these over a period of a couple of days, I can tell you that this recipe is definitely worth making. Preheat oven to 350 degrees F and line an 8 inch square metal pan with foil or parchment paper. Melt the butter in a large (3 quart) heavy saucepan set over medium heat. Reduce heat to low, add chocolate and stir until smooth. If you are using a metal saucepan and butter is very hot, you can remove the saucepan from the heat and then add the chocolate, letting it melt over residual heat. Remove from heat when melted. With a large rubber spatula or wooden spoon, stir both sugars and salt into the chocolate mixture. Stir in the eggs one at a time. Add the flour and stir until well mixed. Fold in the chocolate chips, marshmallows and pecans. Bake for 28 to 30 minutes, or until a skewer inserted in the center comes out moist but clean. Let cool in the pan on a cooling rack for about 30 minutes, then transfer to the refrigerator and chill for a few hours. 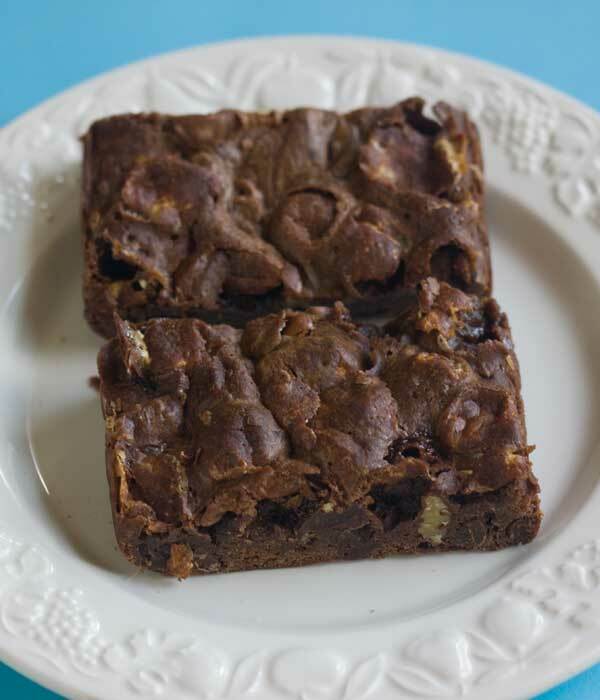 When brownies are very firm and cold, lift from the pan and cut into squares. Wow, that’s great! I need to make another batch soon. This one’s going to go on my Top 10 list for now. I finally made this version of the brownies and they were excellent. A friend said they were the best brownies she had ever had. Thanks for the great tip! I like to buy raw sugar or organic sugar on occasion and found that it gives the best of both worlds — the flavor of brown sugar (though milder) and the consistency of granulated. Substituting 3/4 cup of the Sugar in the Raw was smart. I may try it next time I have some on hand. Thanks for the comment. I just made these today and they came out great. I made one modification with the sugar and used just 3/4 of a cup of ‘Sugar In The Raw’ and no brown sugar or other white sugar and they were perfect. Not too sweet and had great consistency and flavor. Thank you for the recipe. I will definitely make them again. I have a bag of multicolored multiflavored minis to use up. Never thought about putting them in brownies, but I’ll bet they would be good!! Baking is on hold right now because we have had no power since Friday at 3:00 a.m. We purchased the last mid sized generator at Menards and only our sump pump, frige, and freezer are going. Had hurricane force wind and rain Thursday night and Friday night. You can almost swim in our back yard and we don’t have a pool. Texas is throwing some of its weather up to us…I guess Texas is in the sharing mood! Yes, I think the texture is excellent and I think that’s what my kids liked best about them. I think subbing some brown sugar for the white like you did in this recipe would add to the flavor and texture too. Debbie, next time I make brownies from a mix, I might try dumping in a bunch of mini marshmallows just for fun. Paula, I missed it too! Sue, it’s worth a try. I was really surprised at how much flavor the melted marshmallows added to the brownies and loved the texture. Oh boy, these sound amazing. I must have missed the marshmallow-brownie trend, will have to make these pronto! I’m finally home and got to look at my recipe. My recipe calls for all white sugar, no pecans, and I dust the top with powdered sugar after they come out of the oven. Otherwise there are no differences. I haven’t made them in a long time because I fell so hard for cocoa brownies. I’ll have to make a half batch sometime like you did. Interesting. I made similar brownies earlier this week. I used a mix and just added the marshmallows. I put fudge frosting on top. I had done the melted marshmallow versions many times in the past (and that version has either fudge or chocolate frosting above the marshmallow. I guess I don’t like them as well as the marshmallows on top, but they are still very good – and mostly gone now. I will look to see how this recipe compares to one I make. They were my kids favorite brownies when growing up. Makes me want a brownie!